Our collection of luxury playhouses is custom designed to appeal to the clients specific taste and to compliment the main house and grounds. We can create any look, from a fairy tale cottage, rugged fort, tree house to a miniature replica of your own home. Not to be overlooked are the basic amenities any home must have: water and indoor/outdoor lighting. As an added safety feature, we can install a wireless communications hook-up with the main house. We handcraft each house and include details such as hardwood floors, bay windows, and wooden shutters. These are meticulously designed works of art. 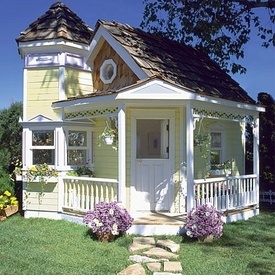 These playhouses enhance any home's exterior. Ceiling heights average eight feet allowing adults to stand comfortably inside. Each house has a living room and upstairs bedrooms. 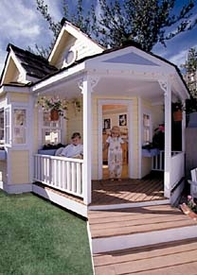 Many playhouses have been made with actual kitchen having running water in them, sunrooms and media rooms. Yest, the still remain their charming scale and appeal. Good taste should begin early. We follow the basic principles of good design and apply them in a scaled down version. A discriminating family wouldn't just hire anyone to design their home; our clients feel the same way about a playhouse for their children. These are custom designed so, please, specify a budget with which you are comfortable and we will send you the proper information. Each house is built on site anywhere in the country. La Petite Maison designer Alan Mowrer will make sure each house will be made exactly how you like it. We also design children's furnishings for both the playhouse or child's room. We can create almost any accessory desired-from a basic table and chair set to a petite-sized wooden stove and refrigerator.